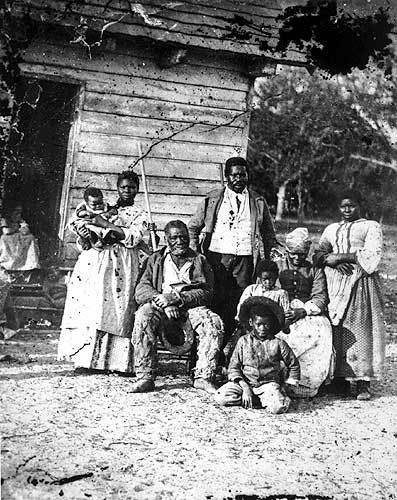 This African-American family was photographed in 1862 after Union forces captured the Sea Island coastal area of South Carolina. One of four photographs taken by Timothy O’Sullivan of the J. J. Smith plantation, this picture was subsequently exhibited at Alexander Gardner’s Washington, D.C., photography gallery in September 1863. In contrast to this Beaufort, South Carolina, family the history of the slave family was usually characterized by constant efforts by enslaved African Americans to maintain continuity in the face of forced break-ups and sales (exemplified in the naming of children to mark lineage). Source | Timothy O'Sullivan, "Five generations on Smith's Plantation, Beaufort, South Carolina," photograph, 1862, Library of Congress, available from History Matters, http://historymatters.gmu.edu/d/6807. Cite This document | Timothy O'Sullivan, “"Five Generations on Smith's Planation, Beaufort, South Carolina",” HERB: Resources for Teachers, accessed April 20, 2019, https://herb.ashp.cuny.edu/items/show/1571.